So tomorrow’s weather forecast is calling for a delightful 31F with snow showers and I’m totally geared up for an explore. It is going to be cold and we’ll have a couple of buddies along to do something we haven’t done in too long, a scouting trip. Scouting trips are always exciting as we never know quite what we’re going to find, there is that wild hope that we’ll come across something totally wonderful and unusual that will warrant a return trip despite knowing the reality is that it often ends with something a little more like this. Usually scouting trips tend to be just Tabula Rasa and me but this time we have a first timer and The Spaniard with us. Hopefully this will not lead to a repeat of the “dogs. Dogs! DOGS!” incident a few years back when Tabula Rasa’s son joined us on his first trip. Instead of dogs and lost chairs, I will hold out the hope we will find something a little more like this. 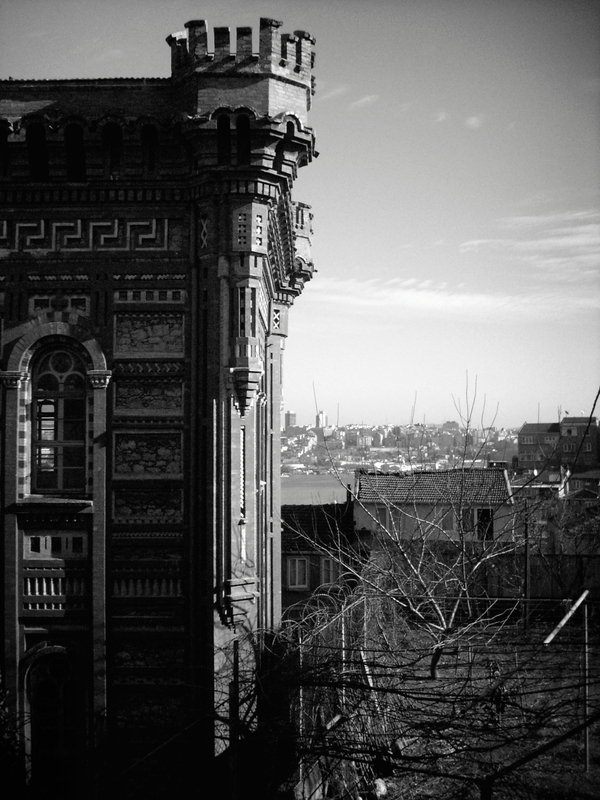 This “castle” is actually a prestigious Greek school located in the Fener neighborhood of Istanbul. 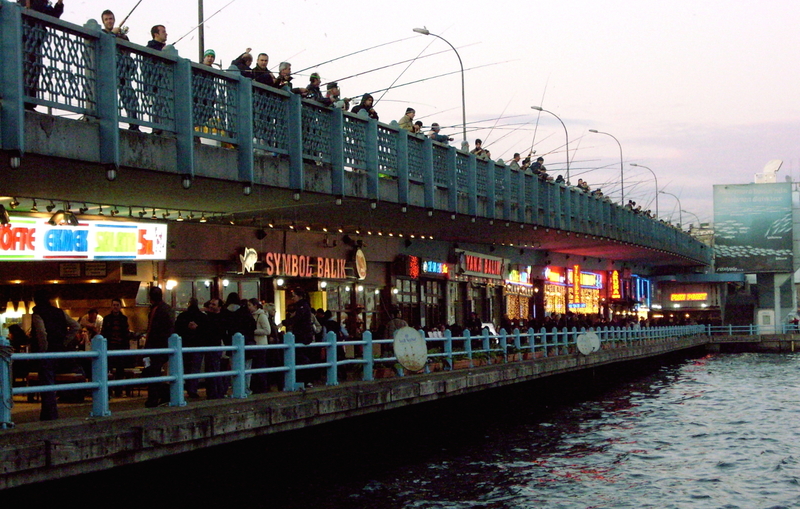 Its presence illustrates some unique aspects of the Greco-Turkish history of this this city. 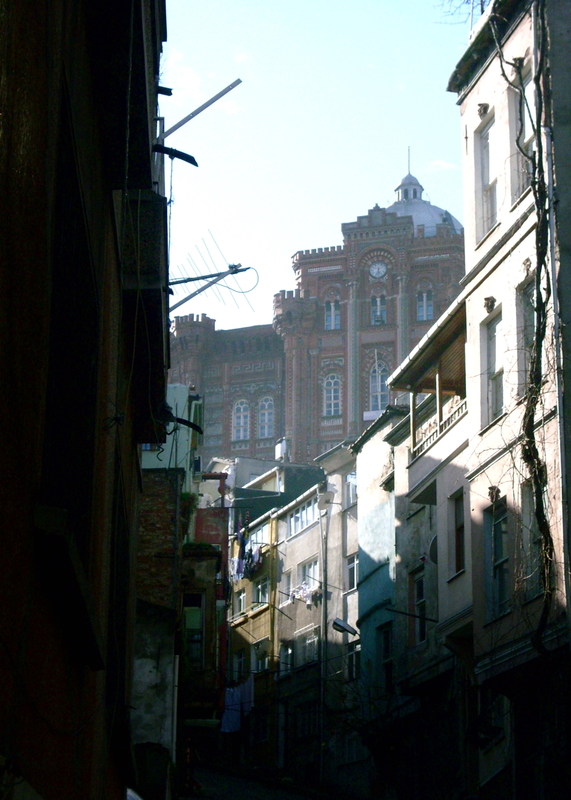 As Constantinople, it was the capital of a huge Greek empire for a thousand years. 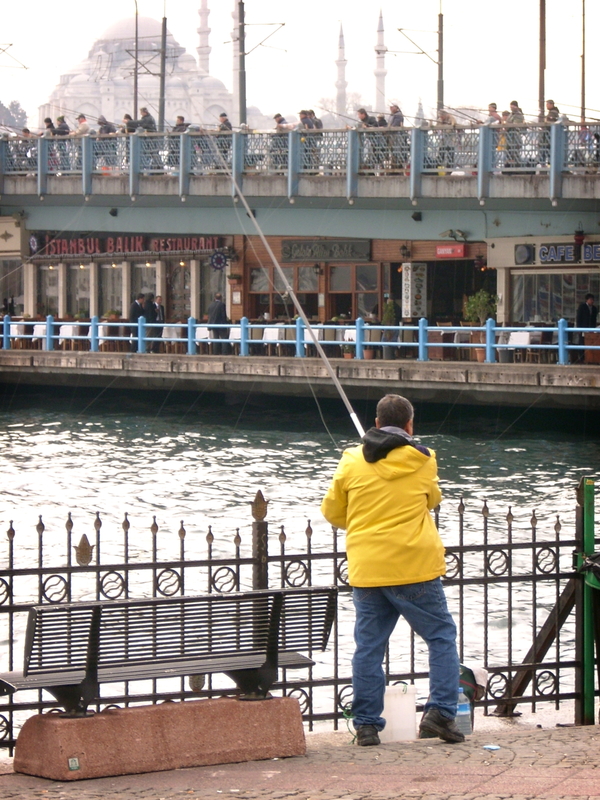 After it fell to the Turks in 1453, many Greeks stayed and continued their cultural and linguistic traditions. 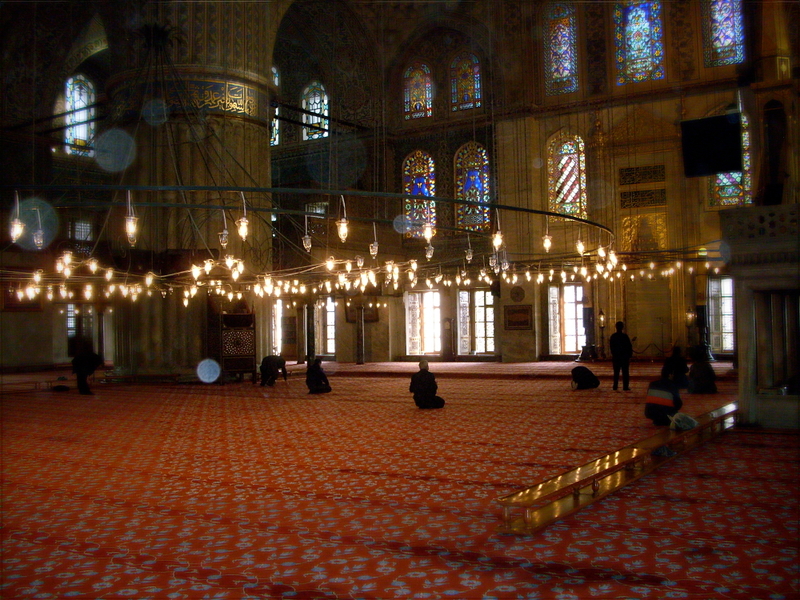 Ottoman rule was enlightened compared to medieval European counterparts, and cultural minorities were tolerated. 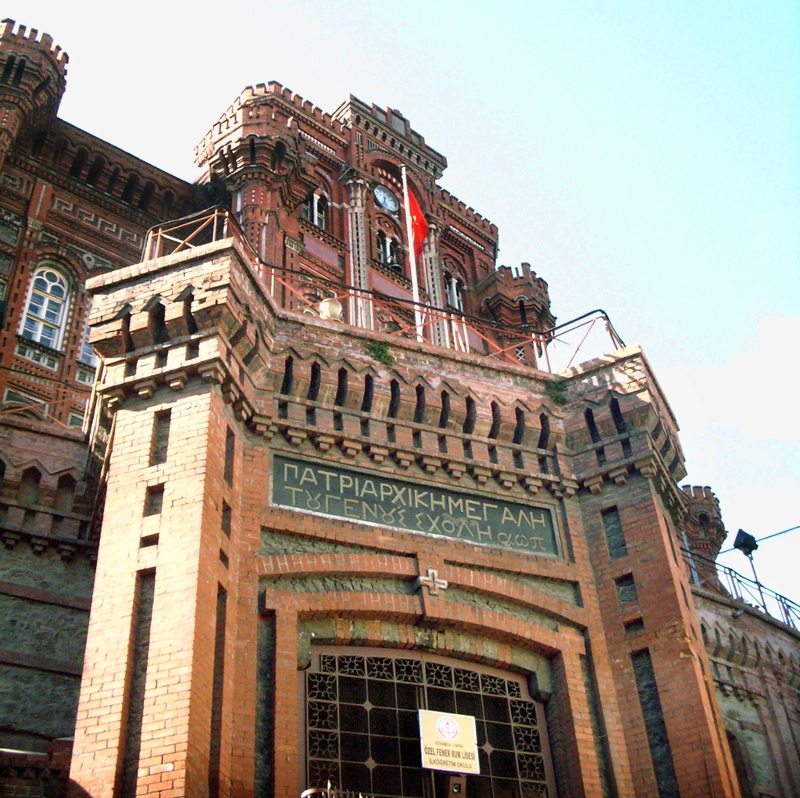 Though the Red Castle itself was built in the late 19th century, the school itself dates to 1454, just a year after the Greek Byzantines’ fall. The school, whose proper name is Phanar Greek Orthodox College, is built into a hill, and surrounded by a dense residential area. As a result, the castle alternately looms into view and disappears around corners as you approach. These shots were all taken the same clear January day. Remember, Axial Tilt is the Reason for the Season! I wish you all the very best and a happy celebratory season. 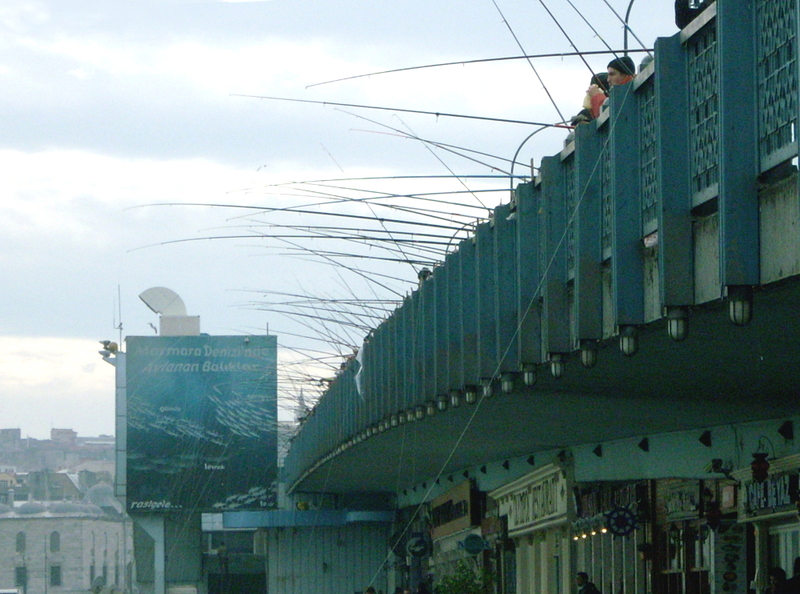 As I mentioned a few months ago, I had found a trove of pictures from a trip to Istanbul which I had thought I’d lost. The task of editing them has been sporadic, so related posts have been random and occasional. The recent lull in fresh photo trips has given me a bit of time to catch up, so hopefully I can put up a few of the better shots now. Incidentally, this was the last trip I took with my old film camera. Given digital’s instant results (at least on a small LCD screen), I don’t miss the Schrodinger’s box aspect of film photography, where you are uncertain of your results until long after taking the shot. So maybe I’m deluding myself, but I found myself really enjoying the grain in these photos. The digital counterpart to grain, noise, seldom adds anything to a shot. But I will leave it to the viewer to decide whether the pictures below have a pleasing graininess, or are just tourist-level soft-focus snapshots. 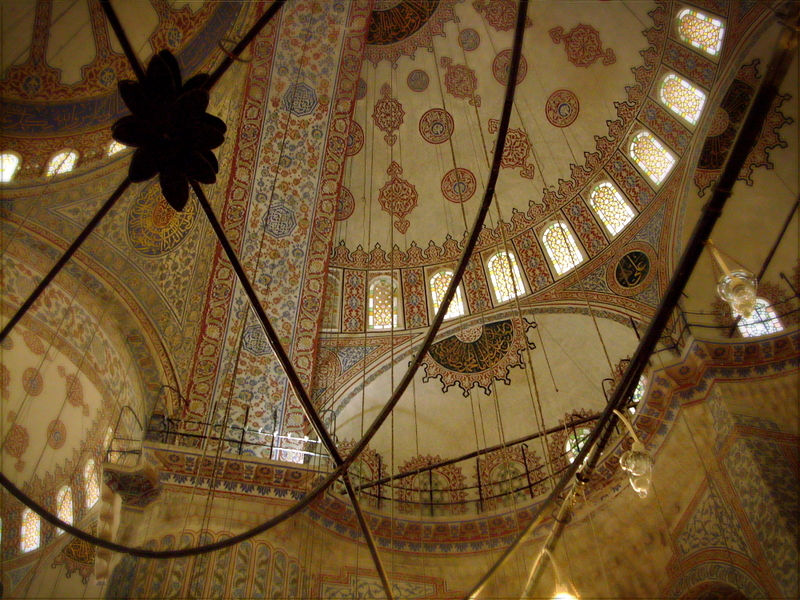 These images are all from inside the Sultan Ahmed Mosque, commonly called the Blue Mosque for the predominant color of Iznik tiles which decorate its interior. 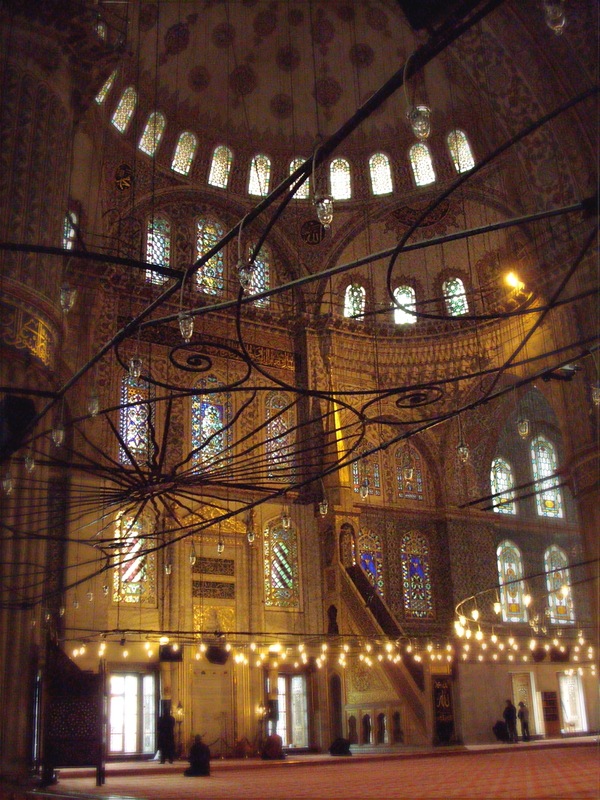 It was built in the early 17th century, partly to provide an Ottoman answer to the Hagia Sofia, a massive Byzantine church the victorious Turks converted to a mosque after capturing Istanbul (then called Constantinople, just like in the They Might Be Giants song) in 1453. Stained Glass and Light Fixtures. This is the result of a little experiment Tabula Rasa and I did with some high intensity glow sticks. While it is far from perfect it has inspired us to try more night shots in the future. The nice thing about glow sticks is that they don’t emit too much light and draw too much attention, but at the same they also don’t put out enough light to overcome the street lamp illumination during a long exposure. I’ve got an idea or two that involves being cheaper than buying professional gear while also offering us more portability and the ability to run on batteries. We’re working on another couple of ideas and may be scouting some new locations as we enter the new year so I promise the blog will pick up sometime in the next week or so. 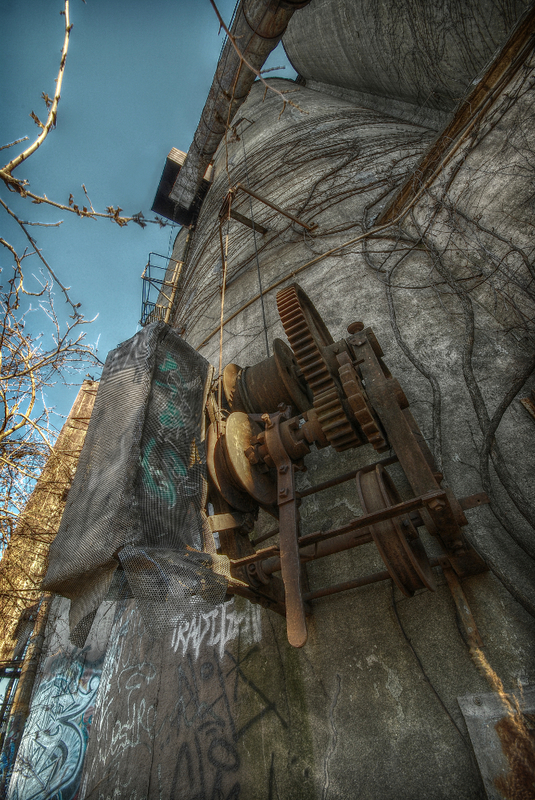 We love Gary Indiana to bits, but we’ve run out of new locations and are looking for something new to explore while we investigate some of our more artistic approaches to our favorite places. Yesterday’s post offered some views of the exteriors; today, we go inside. 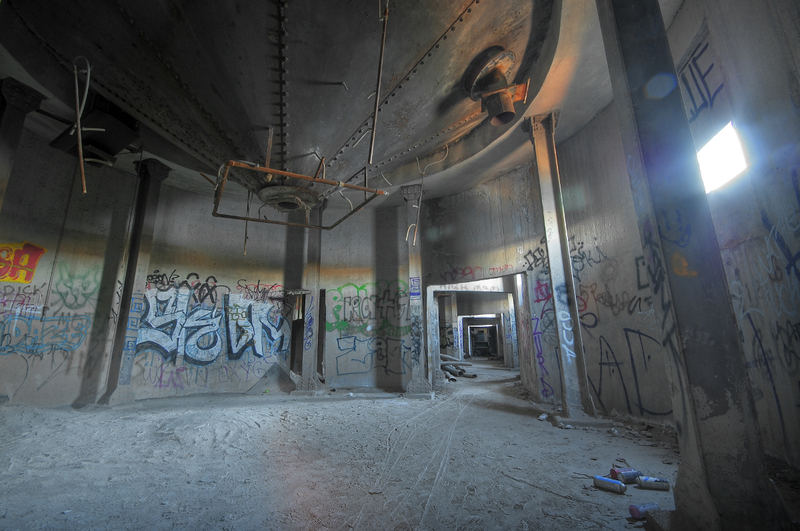 Unfortunately, only the basement and ground floor were accessible, the stairs being nonexistent above a certain point. 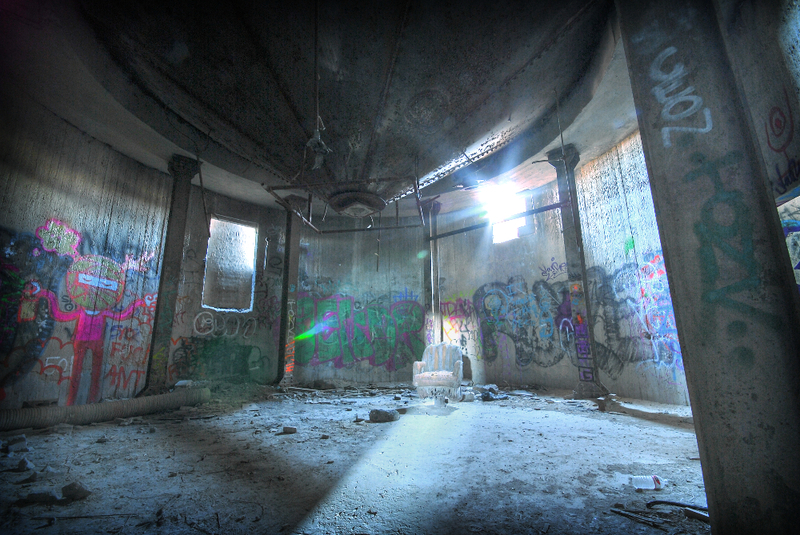 The basement offered some fantastical sights, with each room crowned with a silo bung. 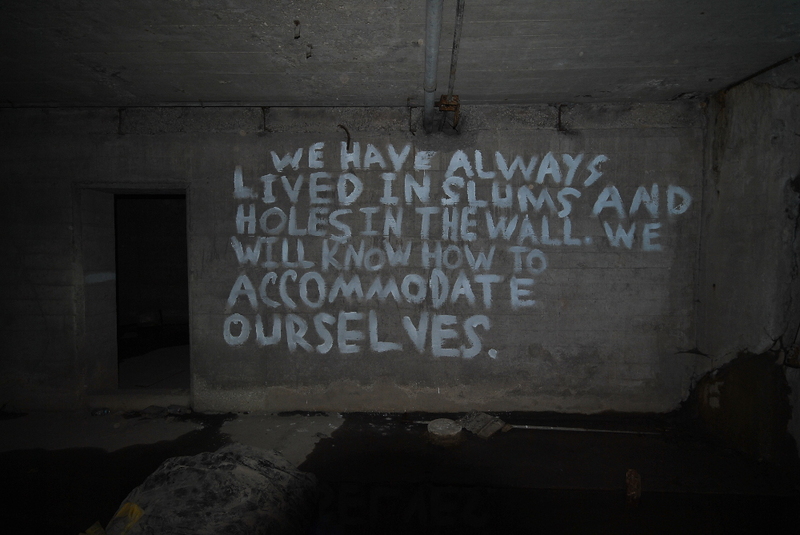 Finally, in some truly hard to reach catacombs in the subbasement we found this, painted carefully across the dank wall. What I still can’t fathom is the motive for this graffito. Only the occupants themselves or rather determined explorers (ahem) would ever see this. Is it a mission statement? A warning? Whatever the case, it would certainly be ironic if these people, so determined to live off the grid, were ultimately forced to move so as to make way for Hollywood filming the latest Transformers vehicle here. 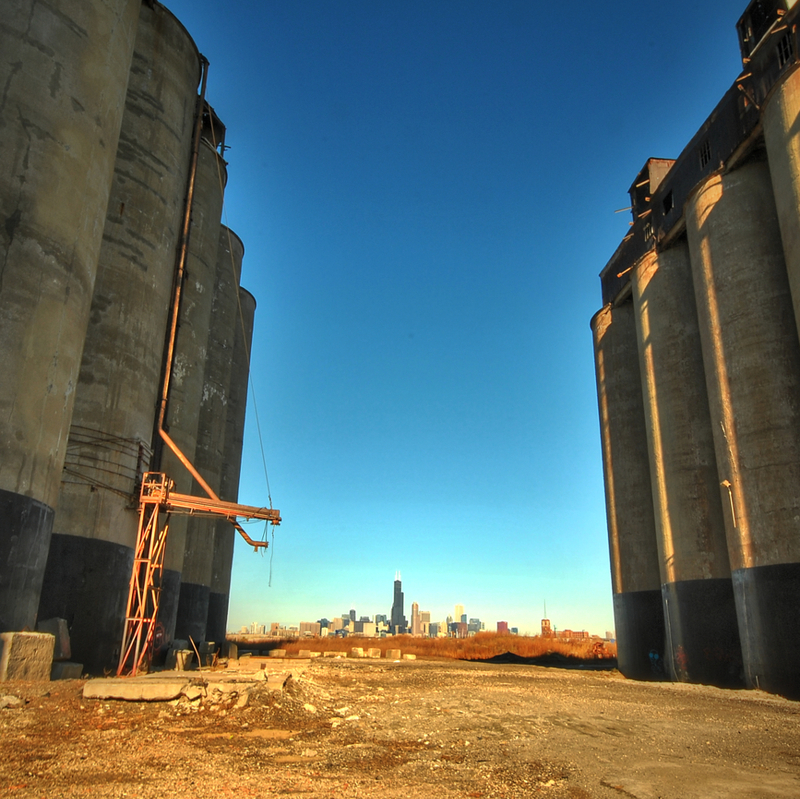 A well known urbex site in Chicago are the so-called Damen silos, just off the Stevenson expressway and Damen Avenue. They’ve gained notoriety recently after filming was done here for Transformers: Shia LaBeouf: ReBeouf. At least I think that’s what it was. 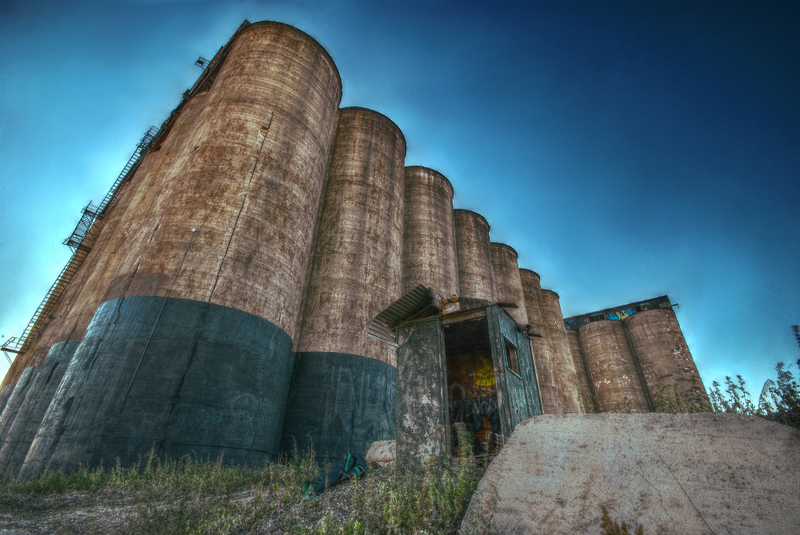 Some elements of the silos were removed during the filming, making for a tougher explore, but they were still worth a visit. 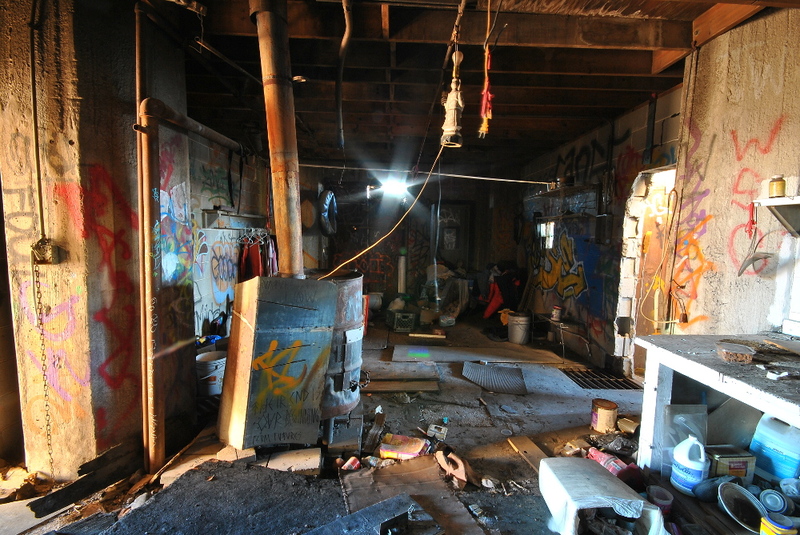 In the next post I’ll have pictures from the interior, which include some rather creepy evidence of recent squatters.